Shadow Minister for disabled people. The Coalition is not a Government that recognises the intrinsic value and worth of life. It is not a Government that recognises human potential, or values personal growth and development. It is not a Government that values social evolution and progress. Trying to explain these fundamental concepts to a Tory is like pondering how best to describe a rainbow and shooting stars to a blind man with no imagination. Or soul. It is common opinion amongst us that the Work Capability Assessment (WCA) – no matter how much it may be re-designed – is not fit for purpose, and that no-one has any faith in it because of the appalling damage already inflicted on so many members of the disabled community. The overwhelming consensus is that it needs to be scrapped. Atos have no credibilty whatsoever, with most of us regarding them with loathing and fear. Unfortunately, many sick and disabled people also recognise that successive Governments have contracted Atos, trust and faith in Government and Ministers has receded. I explained to Anne that some blame the previous Labour Government for current problems, as they originally contracted Atos to undertake the WCA. I don’t subscribe to this view, personally, but I raised the point because it’s one that I’ve encountered frequently, and I recognise that it’s an important issue for some. However, I would like to clarify that I don’t hold a previous Government responsible for what the current one does. Anne explained that the original Labour Party contract with Atos did not happen within a context of welfare cuts, and was very different to the one that the current Government have with Atos. Labour support some kind of assessment, and the old system typically involved a decision that was made entirely by the DWP, and the decision was regarded as final. Labour had felt at the time that this needed addressing with some form of independent decision-making mechanism. We know that the WCA has had such devastating consequences for so many sick and disabled people that it would never be trusted again, no matter how much it was redesigned and “improved” by ANY Government. However, the context of the Labour version of WCA, when it was piloted, was a completely different one to present day. There were many more jobs available, we were not in a recession, and there was support available (and well funded) for disabled people who wanted to work. Anne pointed out again that it is in the context of the welfare reforms, which are about taking away essential support, rather than providing it, that the aims of assessment have become grossly distorted. The original aims were intended to support sick and disabled people. That is clearly not the Coalitions’ aim at all. “A Conservative Government is organised hypocrisy” – Benjamin Disraeli. Disability living allowance supports many in work, and despite Labours’ pleas for common sense safeguards, according to the Hardest Hit survey, three in ten disabled people stated that without DLA their carer would not be able to work. Carers UK estimates that 10,000 people could lose carer’s allowance as a result of cuts to DLA. Without this vital care, disabled people could be forced to turn to overstretched social care services. Liam Byrne stated that here must now be an assessment, in the round, of all the changes hitting disabled people: a cumulative impact assessment. Esther McVey weakly said to the Commons that she wouldn’t order one because “Labour never did one.” Labour did complete a review, and informed this Government of the findings, and raised their concerns regarding the piloted WCA. They were completely ignored. 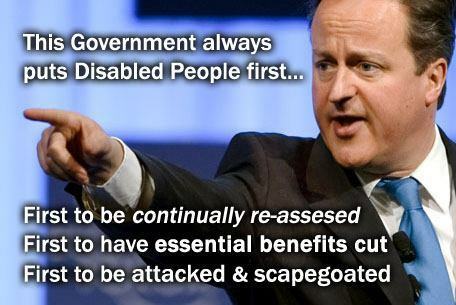 Furthermore, Labour never inflicted the concerted attack we’re now seeing on disabled citizens. It was the Coalition that harshly “reformed” and reduced our welfare provision, and not Labour. The Access to Work fund was re-established by the last Labour Government to ease the transition to work for disabled people, by paying grants to businesses for vital equipment. It was put in place to support people with disabilities, it aimed to reduce inequalities between disabled people and non-disabled people in the workplace by removing practical barriers to work. This fund has seen severe cuts since 2010, which flies in the face of this Government’s claim to “make work pay” for all. By reducing this essential funding, the Coalition have effectively excluded many from work. Additionally, disabled people with the highest support needs have been left in fear and distress following a Government announcement that it is to callously abolish a key source of independent living support. The Government decision to close the Independent Living Fund and devolve responsibility to local authorities follows a consultation that disabled people claim is unlawful and on which an urgent hearing has been scheduled by the High Court to go ahead on 13/14 March 2013. Labour have also challenged the decision to close this crucial source of support. Opportunity for new applications for this funding was closed in June 2010 by the Coalition. Once again this plainly indicates that the Coalition do not consider the needs of disabled people as important, and clearly demonstrates the extent of their eager ideological drive to strip away essential provision and support for the vulnerable. It’s important to acknowledge that there are those of us who simply can not work. The Labour Party agree that regardless of the national employment situation and support for those who could and wish to work, we must, as a civilised Society, make provision and support those who cannot work, too. I’m pleased that this important issue was recognised, because as we know, doctors are providing written evidence to the DWP and Atos that verifies people are not fit for work, and that professional and expert opinion and evidence is being ignored by people who are NOT qualified to decide otherwise. DWP “decision-makers” and Atos assessors have no expertise on medical conditions and how those impact on a persons’ capabilities for work. We know that the majority of Atos assessors are nurses or occupational therapists, and that Atos don’t take into account any medical facts at all: the assessment is entirely about “work capability”. We informed Anne that we are acutely aware that every single part of the assessment process is designed to interpret any capability a person has to complete a task at all, no matter how small, as an indication that they can work. For example, if a person says that they watch TV, that translates as “can sit unaided for at least half an hour”, even if that half an hours viewing is done laid up in bed, propped up by pillows. Huge inferences are drawn from anything that a person can do, and translated into “work capability,” regardless of whether or not person can fulfil tasks without pain, fatigue and discomfort, and it always assumed that people can complete a task reliably, consistently and safely, unless it is explicitly stated that this isn’t the case. Even when it is expressed clearly, it is often ignored and omitted from the Atos reports. Anne acknowledged that there is a significant problem with the WCA descriptors, not least because of the many cases that have been brought to her attention regarding this issue. Anne recognised that the WCA makes it very difficult for health professionals to exercise their professional judgement. It’s computer-based and has little or no regard to the complexity of the needs of severely disabled or sick persons. This is why the British Medical Association has condemned the WCA as unfit for purpose. Those who have been assessed often feel the opinion of their own health professionals have been overridden or ignored. As Iain McKenzie, Labour MP for Inverclyde, put it: “It is ridiculous to have people making an assessment based on a tick-list that looks like it should be used for an MOT on a car.” Anne has observed and acknowledged that people are having their lives ruined by a system that was designed to support them. It is outrageous; it is inhumane, it is shameful. Labour conducted a review of the ESA pilot, and by the time they lost Office, they were aware of the fact that there were problems with the Work Capability Assessment: the main ones being that it did not acceptably accommodate fluctuating conditions, or mental health problems. Labour raised their concerns about this with Iain Duncan Smith, but he refused, as previously stated, to undertake an impact assessment, and he pushed the reforms through and made them law, regardless. Furthermore, the WCA was amended by the Coalition to be even less sensitive to how conditions impact on work capability. We know that when Atos were re-contracted by the Coalition, it was in the context of the “reforms”, and Atos are therefore contracted to remove support from the vulnerable. Dr Steven Bick revealed that there are targets imposed on staff at Atos, and that only one in eight ESA claimants are passed as eligible for ESA (as “unfit for work”) regardless of their actual state of health and their capabilities. This exposes what a sham the entire assessment process is, because it has been decided in advance that 7 out of 8 will lose their eligibility for ESA, no matter how much a person needs that support, or how much of a negative impact this will have on the lives of those stripped of their ESA award. It’s therefore not terribly surprising that Atos reports contain so many widely reported “errors”, “inaccuracies” and “mistakes”. These are actually calculated and deliberate lies, which are also attempts at justifying taking away a persons’ benefit, regardless of the impact this will have on their well being and health. This is what Atos are contracted to do by the Coalition. This has nothing whatsoever to do with genuine assessment. It has everything to do with denying people what they are entitled to, and what they have already paid for. 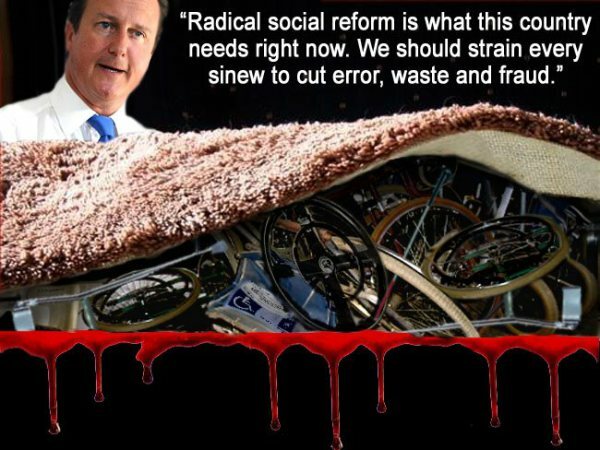 It has everything to do with an ideological drive to strip our welfare provision to the bone. We know that the PIP assessment has targets attached to it, because Esther McVey has indicated this by stating in advance that “More than 300,000 disabled people to have benefits cut”. It is concerning that in making her statement to Parliament, Disabilities Minister Esther McVey set out very clearly the numbers of people who she believed will qualify for the new benefit. But not surprising in light of how the whole legislative process has been conducted by Esther McVey. Conservatives are not known for following established procedure and protocol, nor do they value transparency and accountability. Labour recognise it is people that are the most vulnerable who will bear a disproportionate share of the cuts, simply because of the inequality they face in employment means they are more likely to rely on benefits. In other words they are facing a double penalty simply because of their characteristics – disadvantaged in the (somewhat limited) labour market and now targeted by benefit reform. This also raises concern about human rights, since this constitutes discrimination on the basis of “characteristics”, in accord with Labour’s Equality Act. Anne has voiced major concerns about the mandatory workfare introduced to the ESA Work Related Activity Group, and the sanctions attached to this. She commented: “How can people be punished into work, especially during a recession?” We all agreed that there is a likely contravention of human rights and cited Article 3 of the ECHR – we believe it has been clearly breached. Again, I also pointed out that the issue isn’t so much one concerning the availability of jobs, but rather, it is one concerning the fact that people who have been deemed unfit for work by a doctor are being bullied into unlimited workfare and finding jobs, when they cannot, and ought not be expected to undertake these tasks. Anne agreed again that those who cannot work ought to be fully supported, and should not be not coerced into any kind of work if professional opinion is that they are unfit for work. Once again, the issue of human rights contraventions was raised, and Anne told us that there is a substantial backlog of work, concerning human rights cases, and this is because the Equality and Human Rights Commission (EHRC) – established by Labour – has had its funding severely reduced this past two years, as stated previously. One cannot help but wonder just how calculated the cuts are in light of the extremely punitive nature of the reforms, and the continued blatant disregard of basic human rights, which is very evident in Tory-led policies. Such a well-coordinated attack on our rights seems unlikely to have happened by coincidence. Since the meeting with Anne took place, I have remained in regular contact with her, and Anne Begg, John McDonnell, Tom Greatex, Dennis Skinner and my own MP, Kevan Jones. I send out information and articles on a regular basis, to ensure that the continued impact and the consequences of current policies are known to the Labour party. By raising awareness, we can prompt the Opposition to challenge effectively. That is needed, because we have a Government that doesn’t follow procedure and protocol, and does not like to share information regarding its own policies, even to the relevant Parliamentary Committees, let alone with the Opposition. I am quite serious when I use the term “authoritarian” to describe the Coalition. This is what happens when we become a complacent population, and leave decision making entirely to politicians. Especially Conservatives. We know from history that under Conservative Governments, poverty, unemployment, inequality and civil unrest increase, whilst the wealthy accumulate even more wealth, and the recognition and accommodation of human rights, welfare, and all of our support provisions and programs decrease. We need to learn how to be responsible citizens and participate in how our Country is governed. And we must. We do have a choice: we can each contribute something, when we are able, and in our own way, to raise public awareness and demand positive change. Governments must reflect and serve the needs and interests of the whole population, and not just an elite. It’s our duty and responsibility to make sure that they do. It’s our responsibility to keep the Labour Party informed of our needs, to push for effective challenges to be made against the Coalition, and to promote, prioritise and value social progress, the recognition of human potential, fairness and equality. We set the policy agenda, as voters, if only we will take that responsibility. The Coalition are dismantling democratic process. David Cameron has already stated that he wants to “reduce” consultations, judicial review, and equality impact assessments, amongst other processes that are essential to human rights safeguarding, accountability and transparency. “It’s not how you get things done” he said of these essential processes of inclusion and democracy. Ask yourself what it is that he wants to “get done”, which requires bypassing democratic process and human rights safeguarding. Clearly, this is a Government that certainly intends to continue to inflict harm. We must collectively fight the Coalition’s steady attack on our support programs, welfare provision, human rights, and their determined intentions of undoing all that is civilised and decent about our society. We must maintain those (Labour) principles that make society welcoming, supportive and inclusive to all. It is our own responsibility to recognise the equal worth and potential of every person, and the intrinsic value of each life. It’s an established, historically verified fact that Conservatives never have, and they never will. Labour are currently consulting with the public on a National level, regarding the policy content of their Manifesto. That’s democracy in action. Make sure you have your say. It matters. You can also get involved in Labour policy ideas here and here , or you can contact your nearest Labour MP here . This entry was posted in Employment, Health, Policy Documentation, Topical News, Welfare reform and tagged Anne McGuire, ATOS, Hardest Hit Survey, welfare reform, Work Capability Assessment by adminthinkleft. Bookmark the permalink.